Please join us in signing the Line 9 Pledge of Resistance! “I pledge to support and/or engage in civil disobedience that may result in arrest in order to stop construction on Line 9”. 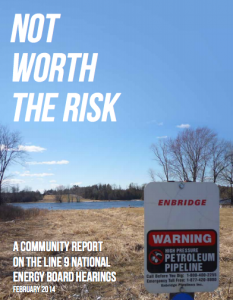 On March 6, 2014, the National Energy Board (NEB) made the reckless and unjust decision to approve Enbridge’s Line 9 reversal project and allow for the transportation of tar sands oil through Ontario and Quebec. But we know that this pipeline threatens our communities, waterways, agricultural lands, and all ecosystems in its path. Moreover, we know that there has been no consent from First Nations along the route of Line 9, making the project illegal under Canada’s own laws. This is part of a broader struggle against tar sands, fracking, and other forms of dirty energy. If the NEB won’t stop this destructive project, we will. Toronto West End Against Line 9 and Rising Tide Toronto put together a comprehensive report of information from the National Energy Board (NEB) hearings around the Line 9B proposal. we are working on our first website. check back in later and we’ll have more content! Line 9: The Tar Sands Come to Ontario from Rachel Deutsch on Vimeo.